"What are the odds of getting even? 13 to one." Ocean's Thirteen is a comedy about a heist that takes place amid the glitter of the Las Vegas gambling scene. 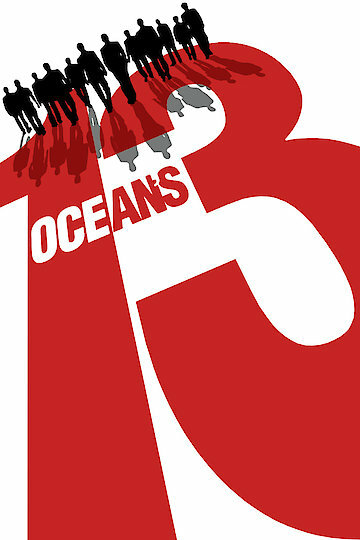 It's the third film in the Ocean's Triology that began with the 2001 remake of the original 1960 Ocean's 11 movie. Danny Ocean attempts to help pal Reuben Tishkoff after Tishkoff has been swindled by former business partner Willy Bank. When Bank refuses Ocean's attempts to make things right, Ocean calls on his own former partners in crime to participate in a plot that will ruin Bank financially on the opening night of his new hotel and casino. Part of the plan is to make sure that a reviewer responsible for bestowing the coveted Five Diamond Star award on the newly premiered property has a less than stellar experience during his stay. The second part of the plan involves fixing the casino's gambling games and machines in order to force a multi-million dollar payout. But the plot thickens when Ocean's gang encounters numerous problems and is forced to ask for help from their nemesis, Terry Benedict. Ocean's Thirteen is currently available to watch and stream, download, buy on demand at TNT, Vudu, Google Play, FandangoNow, iTunes, YouTube VOD online.